The wood: Cathouses and padded platforms are crafted from high quality and flexible birch plywood and impregnated with oil wax. This finish gives the surfaces extensive resistance against moisture, as well as their robust and easy-care qualities. The visible wood grain and the decorative multiplex edges give the furniture an outstandingly stylish appearance. All wood edges are rounded, the surfaces are polished – excellent quality of craftsmanship, as you expect from sophisticated furniture. 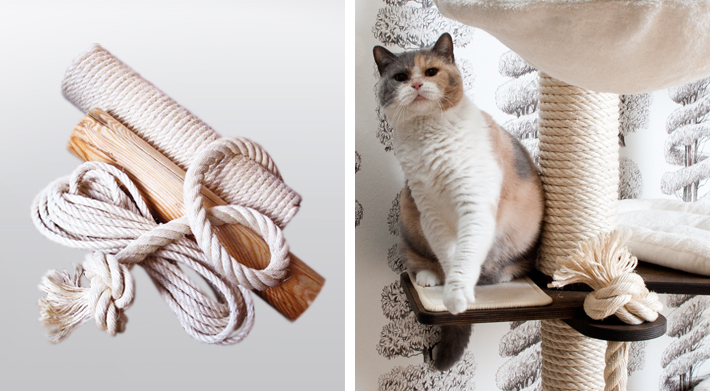 The scratch posts: Profeline solid wood and sisal scratch posts have a total diameter of 12.5 cm. The substantial solid wood posts are sourced from sustainable supplies. The natural sisal rope is produced by a local rope maker in Germany. The rope is firmly wound around the post, then fixed with water-soluble glue and placed in a tear-proof groove. Stainless steel M10 connection bolts and screwed sockets guarantee maximum stability. The padded platforms: Depending on the model, you can choose between carpet covers, sisal covers and washable velcro cushions. The carpet grade employed by us is typically used in heavy-duty office environments. This carpet is particularly durable and easy-care due to its short and dense pile. The loungers are slotted on and can be removed for comfortable vacuum cleaning. Heavy soiling can be removed with carpet foam. And if the worst should happen after all, the platform can be exchanged entirely. The carpet is tested for harmful substances and has been certified with the environmentally safe seal of approval at grade “GUT” (good). sisal covers are slightly more difficult to clean. The slotted-in platforms can, however, be replaced at any point. The velcro cushions are fleecy underneath, allowing them to attach easily to the velcro points on the wooden platform. The are machine-washable and can be placed in the tumble dryer. We supply flat padded velcro cushions for the flat platforms and padded velcro cushions with high sides for the deep platforms. The fluffy Profeline velcro cushions are made from soft snuggle-cotton and they are designed to meet all of your cat’s requirements. The fabric is heat regulating and the high proportion of cotton prevents any static charge.